As Janell Burley Hofmann, mother of five, wrapped her 13-year-old's iPhone on Christmas Eve, she was overwhelmed by questions: "Will my children learn to sit and wonder without Googling? Should I know their passwords for online accounts? Will they experience the value of personal connection without technology?" To address her concerns, she outlined boundaries and expectations in a contract for her son to sign upon receiving his first cell phone. When Hofmann's editor at The Huffington Post posted the contract, now known as iRules, it resonated on a massive scale and went viral, resulting in a tsunami of media coverage and requests. It quickly became apparent that people across the country were hungry for more. In iRules, Hofmann provides families with the tools they need to find a balance between technology and human interaction through a philosophy she calls Slow Tech Parenting. In the book, she educates parents about the online culture tweens and teens enter the minute they go online, exploring issues like cyberbullying, friend fail, and sexting, as well as helping parents create their own iRules contracts to fit their families' needs. 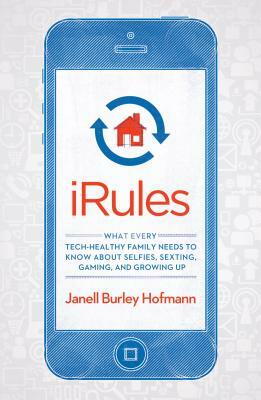 As funny and readable as it is prescriptive, iRules will help parents figure out when to unplug and how to stay in sync with the changing world of technology, while teaching their children self-respect, integrity, and responsibility. Janell Burley Hofmann is a parent coach who writes about parenting and technology for The Huffington Post; has a weekly spot on "American Public Media Marketplace," NPR, as tech etiquette consultant; and has been covered by major national media, including Good Morning America.